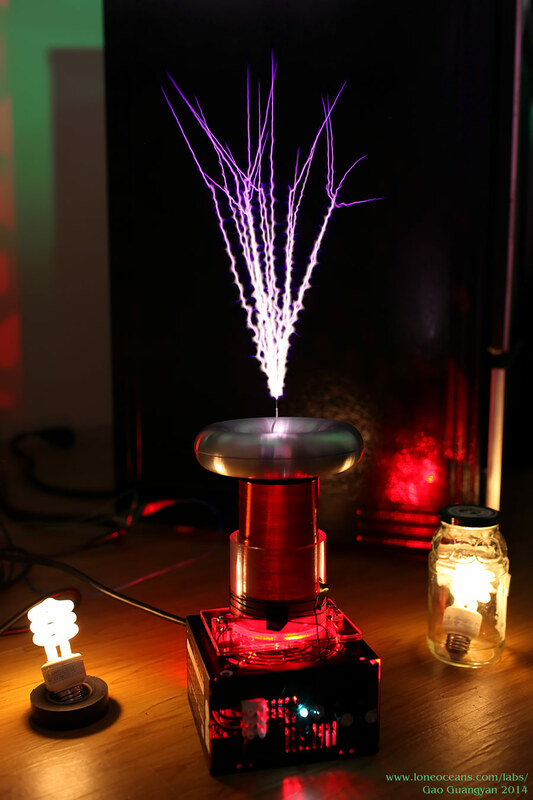 After seeing how successful my weekend SSTC 2 project went, I though I'd give another go at making my third solid state tesla coil (hence SSTC 3). You might have noticed that I have called it a RSSTC, or Ramped SSTC, because of the straight sword-like sparks I wanted to create with his coil, to mimic VTTC and QCW DRSSTC sparks. The 'ramped' part describes the ramped voltage input into the inverter. In addition, I wanted to use this opportunity to develop a simple, easy and compact General Purpose SSTC platform where I could use as a base to build various sorts of SSTCs and DRSSTCs very quickly! 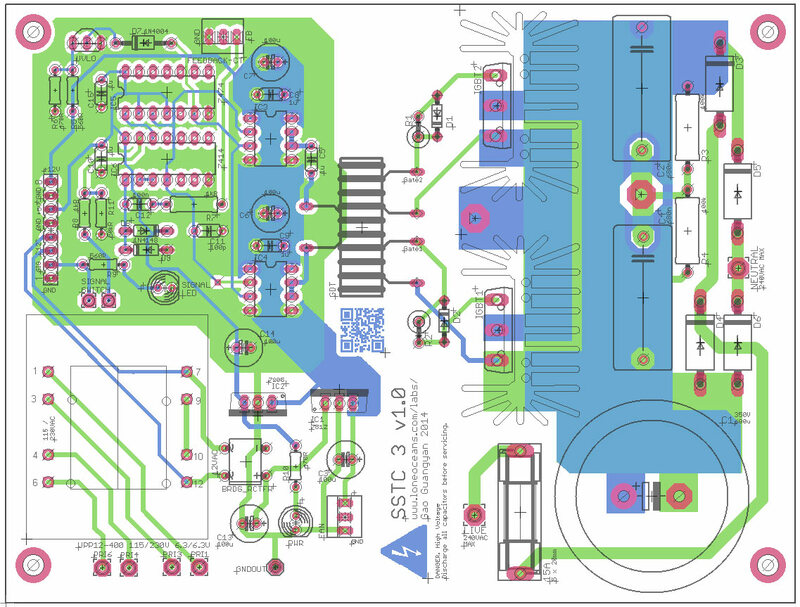 My previous SSTC 1, SSTC 2 as well as other DRSSTC project pages provide a more detailed description of the workings of an SSTC, so be sure to check them out if you're not familiar with general SSTC operation. *Boards for Sale*: I had a bunch of leftover boards left from the development of this project - While stocks last! Check it out here. R-SSTC 3 in action at 120VAC input. Two control knobs control spark repetition frequency and pulse width respectively. 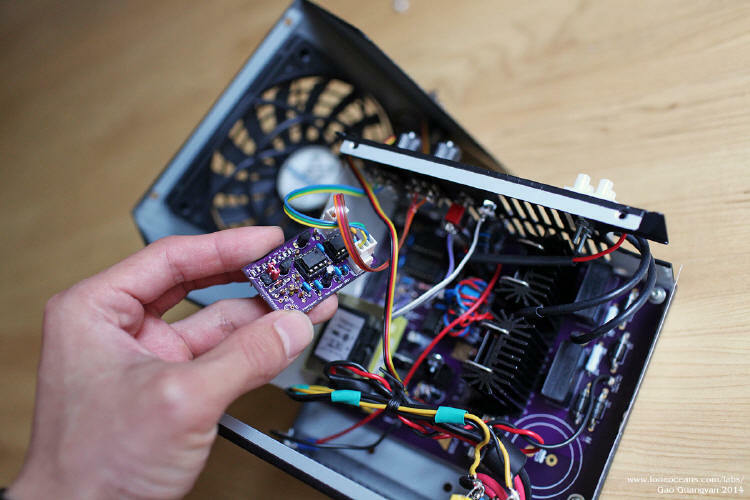 Before I begin, you should have a general idea of how an SSTC works. I hope that my SSTC 2 page serves as a reasonably comprehensive introduction. Check it out if you are not familiar with SSTCs. So what's so different about an RSSTC compared to a conventional SSTC? - It is designed to produce straight, sword-like sparks, versus the characteristically bushy and branched sparks of conventional coils. 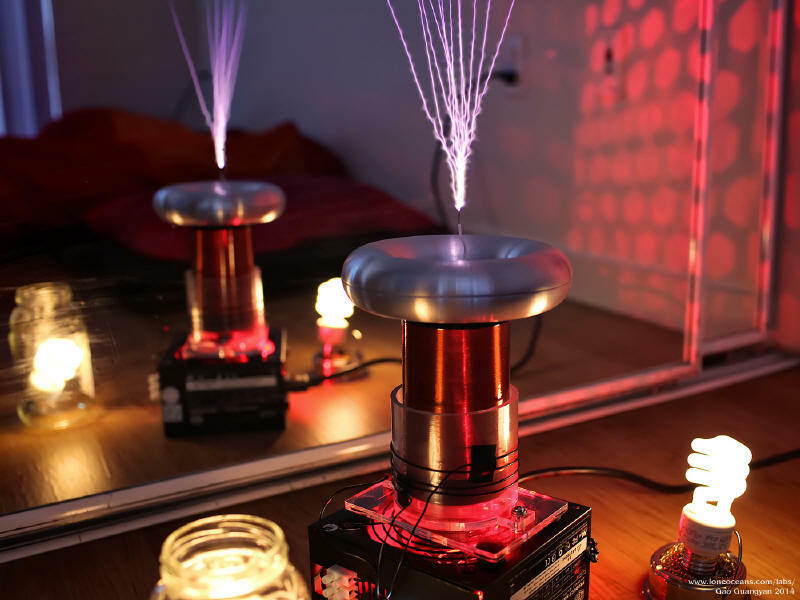 In a way, it mimics closely the output behaviour of many Vacuum Tube Tesla Coils (VTTCs). 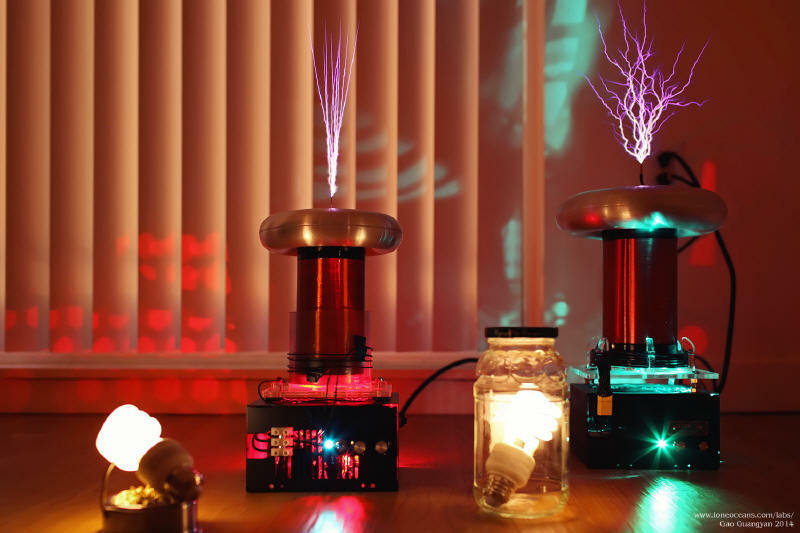 Till date, there has been very little academic research on the physics of spark formation, especially for those produced in Tesla Coils. Tesla Coils generally produce very branched 'tree-like' sparks, often resembling real lighting, taking the shape of plant roots. As amateurs began building more and more coils, they started to modify various coil running parameters to improve performance. Creating sword-like sparks can be traced back to the early days of VTTCs, and was born out of result of trying to reduce the input power of a VTTC while maintaining a spark output length. Back in 1993, John Freau came up with the idea of achieving this in VTTCs by what he called a staccato operation - in his own words, "(running) the VTTC for a full AC half cycle, then (disabling) the VTTC for a selectable number of AC half cycles." This has since become a staple design in VTTCs and helps significantly in preventing tube overheating. Today, the design is easily implemented as a simple zero voltage detector, triggering two 555 timers, one dictating the pulse duration and the other, the repetition frequency, among other designs. 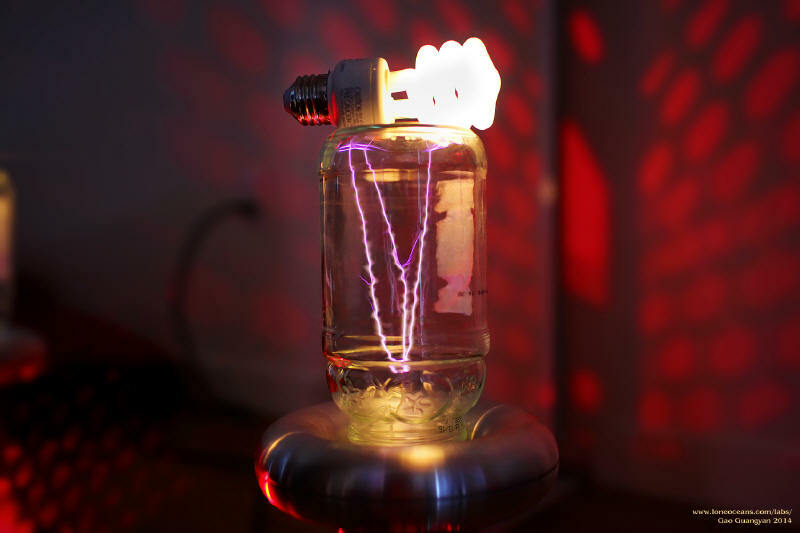 When people started experimenting with this, they realized that the VTTC not only made characteristically straight, sword-like sparks, but it also seemed to do this because of the shape of the input voltage. One more thing - coilers also noticed that as the frequency went up, the straighter the sparks got in their VTTCs. A conventional SSTC has an inverter which runs off a (usually) filtered DC power supply, so the voltage output is essentially constant. This produces the characteristic bushy spark appearance, but hardly ever straight sparks of a VTTC. Around 2004, Steve Ward wanted to re-create the straight sparks produced by VTTCs in his solid state coils. Comparing with VTTCs, it was clear that one main difference was the input voltage. While SSTCs conventionally run from a filtered DC source, VTTCs usually run from an unfiltered source. The goal was then to mimic this rising action seen by VTTCs in staccato operation. 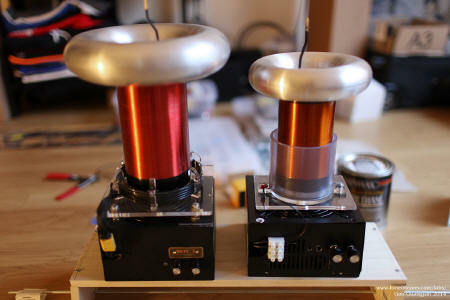 This has led to newer designs such as the QCW DRSSTC, or the SSVC (Solid State Valve Coil), created by Philip Slawinski. Both of these coils are conventional DRSSTCs and VTTCs but running with a ramped voltage input, usually from a buck converter. Newer designs such as the phase shifted QCW also mimic this effect across the bridge. 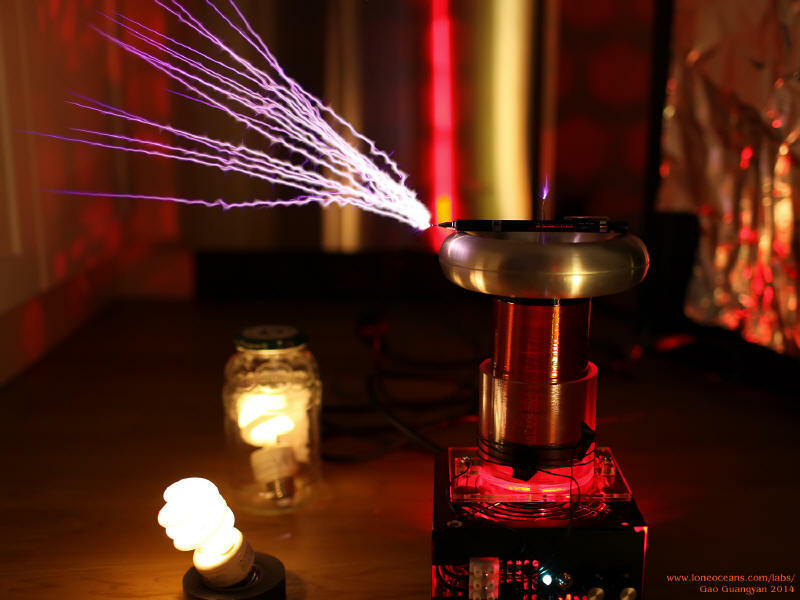 After many experiments by the Tesla coil hobbyist community, it seems that higher frequency leads to straighter sparks, but at the expense of silicon switching capability. It seems that the sweet spot of compromise is around 380-420kHz, with a lower bound of about 320 to 350kHz. Any lower and the sparks begin to take on the usual branched / fractal form. Back to RSSTC 3 - I wanted a simple platform to study these effects, but without the complexity of a buck converter to create the voltage ramp. So my plan is very straightforward: to run a conventional SSTC from a non-filtered main source using staccato operation to turn on the coil only during the rising voltage wave (so the first 1/4 wave) of the AC cycle - this makes for a easy ramped input. 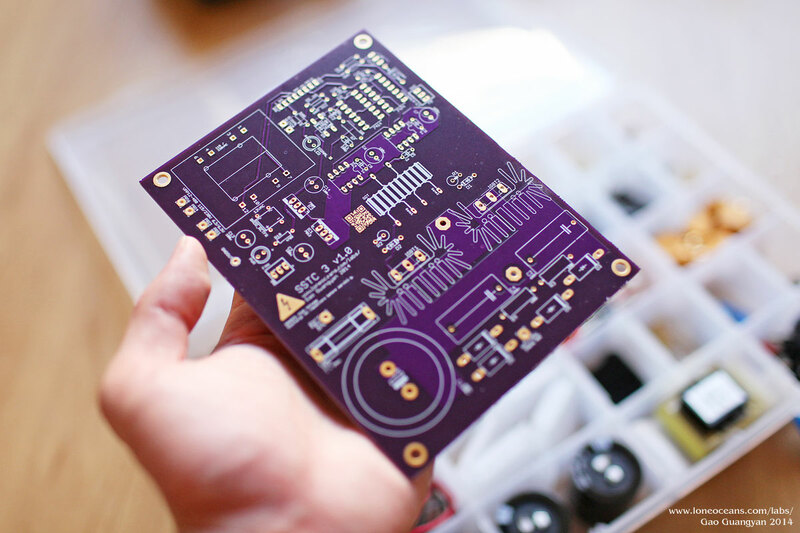 The second goal for this project was to work on a prototype for a single-pcb generic PCB design which I could mass produce in larger quantities, which I may or may not offer for sale in the future. This will allow me to realize the 'Tesla Coil on a Board', so I can basically wake up in the morning, decide I'll like a Tesla Coil, a get one built before dinner! I also wanted to design the board to be general purpose, so I could use it at not only different input voltages (120 / 240) but also allow for DRSSTC operation and quick swappable controllers / interrupters. I also just shifted to a new apartment, and therefore lack a lot of the tools in the workshop I used to build my things at. So another goal would be to see if I can streamline my process and make the whole coil as simple and elegant as possible with my limited tools and materials. One of the characteristics of such a RSSTC design is to create long - straight sparks, but without the complexity of QCW DRSSTC work. 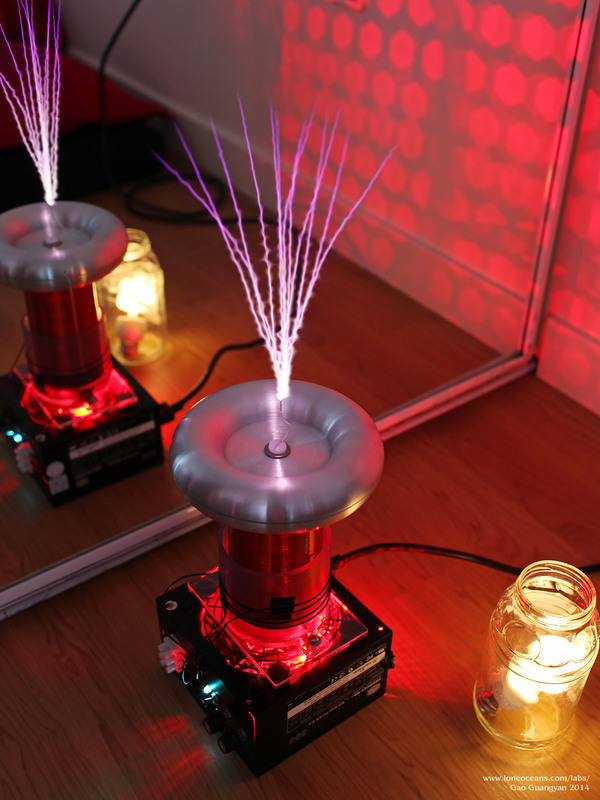 So a performance goal would be to produce impressive looking sparks for a given coil size. I also happen to have a 1.5 x 6" toroid on hand which I bought a while ago on ebay. 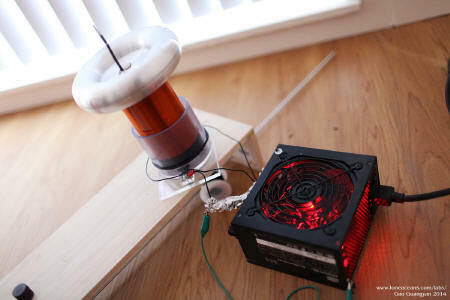 Therefore, I plan for the coil to be my most compact SSTC to date, being easily transportable in a small bag, robust enough to be thrown around in luggage, and produce sparks at least 2x the secondary length 5"), with a 2.5x stretch goal (12.5" or ~32cm sparks from a <13cm secondary). [Update - this goal was easily reached with final 240VAC operation and two stacked toroids - might replace with one bigger one]. The next section will discuss each component in detail as I document the design process and construction. - Eight-pin breakout jack for swappable interrupters just like a graphics card on a motherboard! Here's a quick description of the circuit. The top right describes a general low voltage power supply providing 12V for the gate drivers and a fan, and 5V for everything else including a power indicator LED. Power to the bridge is simply full wave rectified. The bridge accepts any sort of TO-247 IGBTs and is wired up in a conventional half bridge configuration with 680nF DC blocking capacitors. The bridge was also designed to be laminated and of very low inductance to reduce switching spikes. The gates of the IGBTs are turned on via 5.6R resistors and shorted by a diode to allow fast turn-off - this creates a little bit of dead-time to prevent any shoot-through. When a 5V 'on' signal is supplied by the interrupter (pin 2 of the breakout), it sends a signal to the D-flip flop. The flip flop ensures that the Enable signal to the gate driver chips terminates at a rising zero crossing. This is especially important for DRSSTC use. At startup, a short pulse is sent through the two UCCs, through the GDT, and one IGBT is turned on. 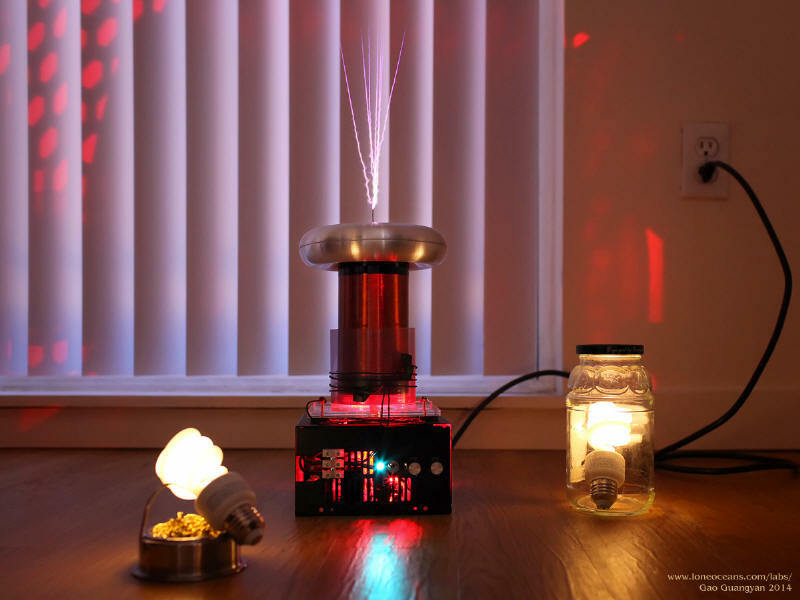 This sets up oscillations in the secondary coil at its resonant frequency. This signal is picked up either by a secondary feedback coil (which I'm using - read below for more detail), or just simply an antenna. A primary CT can be used instead if I decide to run this as a DRSSTC. 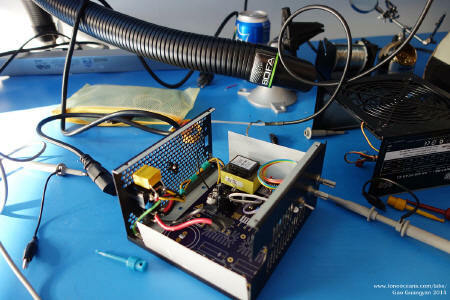 This signal is clamped by the two diodes from the feedback input and cleaned up by the 7414 inverters, which sends a clean square switching signal to the gate drivers. 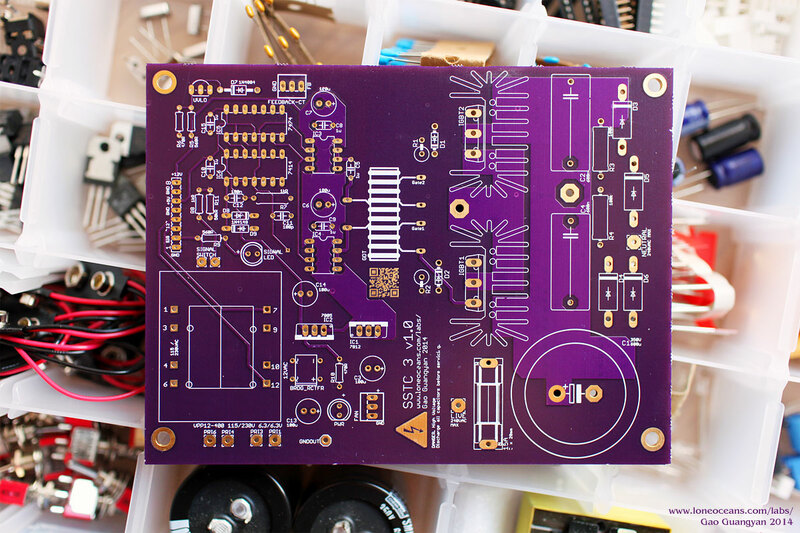 In all, quite straightforward and no different from the standard SSTC design used by hobbyists around the world. For more explanation how the D-flip flop works, notice Pre' and D are pulled high always. When the interrupter turns on (H), it is inverted and fed into CLR' (L). Output Q' is H and drives the enable turning the UCCs on. When my interrupter pulse ends (L), H is fed into CLR'. However nothing happens, only until the next rising clock edge from the feedback (and with D at H), Q'(n+1) then transitions to L turning off the UCCs, so this way the flip flop terminates the pulse only at rising crossings. By doing so, it prevents the bridge from turning off half-way through a cycle, which is hard on IGBTs in DRSSTC operation where currents can be very high. This is not so crucial for normal SSTC operation. More design explanations are outlined in the following sections below. With the schematic done, it was time to lay out the board! I grabbed a cold drink from the fridge and routed the traces. The board layout builds upon my SSTC 2 design, but this was designed specifically to fit nicely into an ATX power supply box! While almost all ATX boxes are the same size, it turns out that the PCB dimensions inside differ slightly, as do their mounting points. 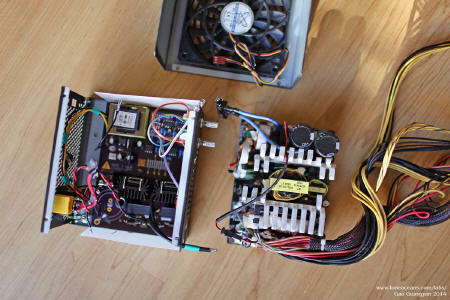 I managed to find a bunch of different ATX power supplies and disassembled them. I found that they are (the PCB inside) generally 145mm long with a 134mm hole spacing. The widths differ depending on the design, but 110mm seems to be as wide as it can go since many cases include an 80mm fan. Hole spacing on the short side ranges from 95mm, to 99mm and 103mm. Based on these measurements, I designed the board to fit the most common configurations and added some clearance around the holes to allowing making slots if required. The final v1.0 result is shown above! Note the ground/power planes on the logic side, along with the laminated bus on the power-electronics half. The laminated design is crucial for clean switching :-). 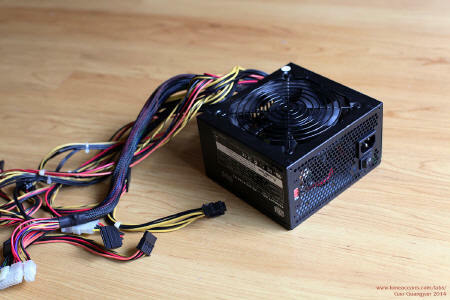 As for height, there are ATX PSUs with a 120mm fan at the top of the case (25mm thick), or those with none at the top but with an 80mm fan at the side. To accommodate all cases with any sort of fans, the height limit for components on the board was designed to be 70mm - 25mm = 45mm. This formed the size limit for my heatsinks, bus capacitor and low voltage transformer. I carefully chose my components to fit. 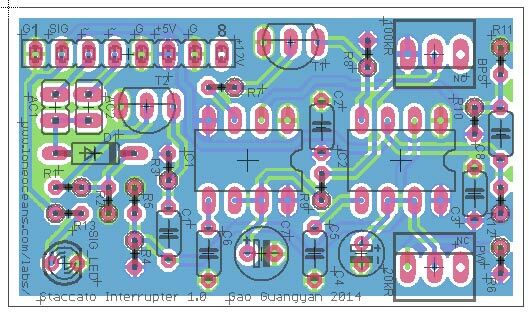 Due to differing voltages across the world, I decided to design the board for 240VAC (hence no voltage doubler on the power bus). 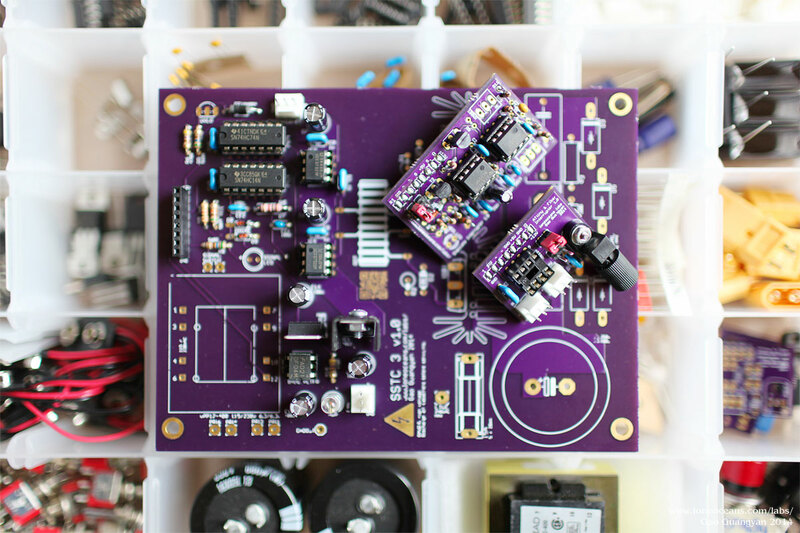 If desired, a voltage doubler can also be added if required, separately out of the board. The logic power supply will use a dual voltage input 12VAC signal transformer for use on both 120 and 240V lines, providing power for the logic, drive, and fan. For safety, an under-voltage lockout was also added. I decided to bite the bullet and send the boards for fabrication instead of etching one myself. I used OSHpark which was somewhat pricey, but I thought it was a good choice for a low-volume test run. Less than two weeks later, I got the boards. 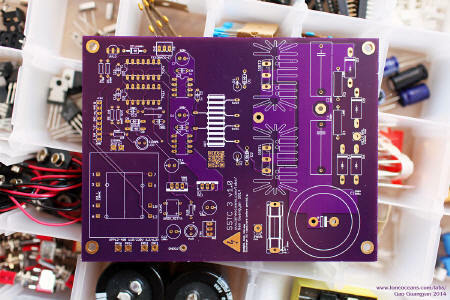 Look how beautiful it turned out in purple solder mask and gold plated surfaces! Note that I left some of the power traces on the bottom unmasked so I could thicken them with solder for greater current carrying capacity / thermal performance. Next I designed a few swappable interrupters for the board. The most important was of course the staccato interrupter to make my sword-like sparks. The design is simply made from two 555 timers and a zero crossing detector. Pins 3 and 4 of my breakout connect to 12VAC from the transformer. My schematic is shown above. Note the jumpers to allow selection of the correct direction of the AC signal. The pulse-width and pulses per second are controlled by a 20k variable resistor (and the 200nF C4 capacitor) as well as a 100k variable resistor (together with a 10uF capacitor). 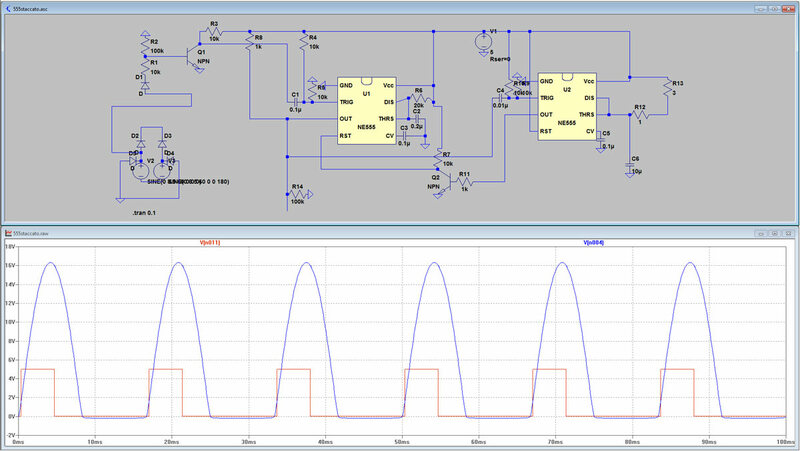 I did a simulation in LTspice to make sure I had set up the circuit right. The result is a frequency range from 60Hz to 0.9Hz with a pulse width ranging from 900us to 4.4ms for a maximum duty cycle of about 27%. With that done, I proceeded to route the board to be as small as I could make it while still using parts I already had. The result is a small cute board measuring less than 1 by 2 inches! While at it, I also designed another small board which uses an ATtiny interrupter I designed for SSTC 2, as well as a fiber optic input for use with my musical DRSSTC controllers! I was glad how beautiful they both came out. The 8 pin socket for the interrupter boards also worked flawlessly. These 8 pins provide 12VDC, 5VDC, 12VAC, interrupter signal and 4 grounds. Note that I made sure to orientate and route the 3-pin potentiometers correctly for both interrupters so I can simply unplug and plug them in easily when swapping interrupters cards. I designed the Driver board to be exactly the same dimensions as the PCB board found in most standard ATX power supplies. This allows me to mass produce these boards in the future, and it'll fit perfectly into the screw-mount holes of any almost all standard ATX power supply cases! 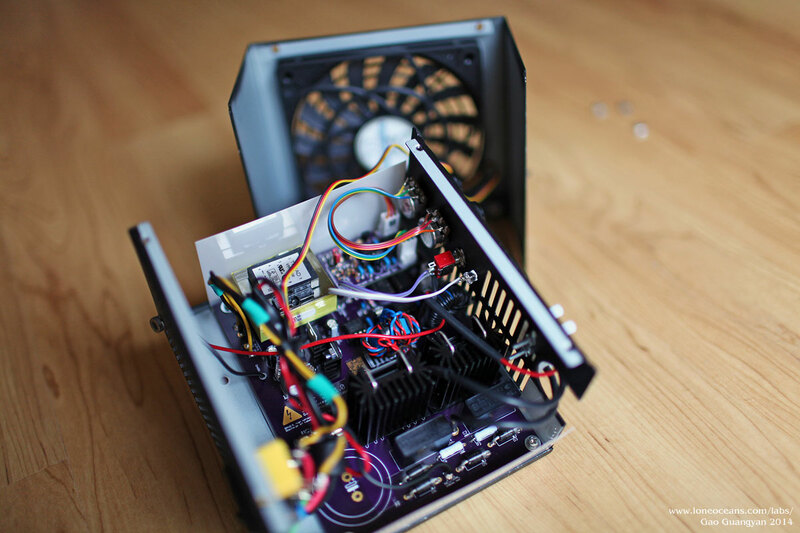 For this project, I used a nice used black ATX power supply box just like my SSTC 2. It contains a switch which I will wire to the bus (so the logic is on the moment the coil is plugged in). 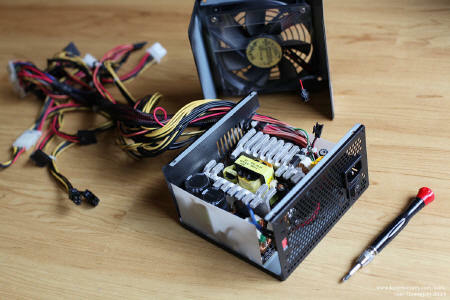 Unfortunately the power supply came with a jammed fan, so I replaced it with a thin-profile 12mm thick 120mm fan. Other connections / attachments include two holes drilled into the case to accept two potentiometers. Extra holes were also drilled for a signal indicator LED and a signal switch which enables the interrupter signal to the driver. But will the board I designed fit? It does! The beauty of using an ATX power supply means that not only will a standard IEC jack be provided in box, but also a switch, EMI filter, as well as a fan, grounding cable, and even a cut-out slot for the primary cables. The coil's geometry was mostly determined by an existing toroid I had on hand - a very nice 1.5 x 6.0" spun aluminum toroid I got on eBay for $20. Therefore I used this as a basis for designing the coil. I wanted the coil to be as compact as possible, whilst still looking reasonable. To allow using as thick a secondary wire as possible, I had to choose the diameter of the secondary coil to be as large as possible - 3". 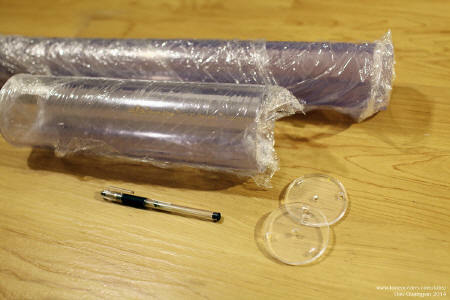 However, nobody makes a pipe this exact outer diameter size, so I'm decided to use a 2.5" Sch40 PVC pipe (OD of 2.875). Using just about 5" winding length gives me just about 400kHz with 34AWG. 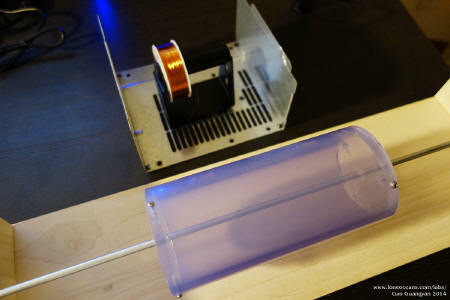 Using a 3" PVC pipe as a core for the primary (3.5" OD), and a winding length of 0.6" with 5 turns (arbitrary number) of AWG 14, we arrive at a secondary Fres of about 410kHz, a primary inductance of 3.7uH and a coupling of 0.345k. Here is a more or less to-scale mock up of the coil on the right using JavaTC. I've also added other components. Note that it does look similar to my SSTC 2, but is smaller and more compact. [Update - it turns out that I once again forgot to take into account the thickness of the insulation. I found that for most 34 or 36 AWG wires, the enamel thickness is about 0.4mil on each side. This means that I will have to multiply the number of windings by 0.887. This gives me closer to 680 turns, and a resulting new resonant frequency closer to 490kHz. I later added a second toroid to bring the new resonant frequency down to 452kHz. The calculations below are updated. With a primary spaced 0.8" long, 4 turns in total, and a new 452kHz frequency, the reactance of the primary (2.12uH) can be calculated to be X_L = 2pi * f * L = 6.02 ohms. Since the DC blocking cap presents a low impedance (we can usually ignore it, but since I'm using a small 340nF cap equivalent, it has an impedance of X_c = 1 / 2pifC = 1.035 ohms or 7.06 ohms total). Assuming no primary resistance and a 208*Sqrt2 peak to peak square wave across the primary at the end of the ramp (RMS of 147V across the bridge at 208VAC input in the full wave rectifier), we should see a peak current of about 20.8 Amps. The current can be increased by reducing the primary impedance - i.e. using fewer number of turns, or spacing the turns further apart. Note that the addition of a primary series capacitor to make the total tank capacitance to 58nF will bring the coil into resonance (reactance cancels) and thus become a DRSSTC! This is easily done by adding a 68nF capacitor in series with the primary for this geometry. - The coil is designed to be run off 240VAC eventually, but I currently only have access to a 120V and 208VAC line. - Due to the nature of the ramped-voltage input, I can only use full wave rectification with no smoothing for the bus input. Running the coil on 240VAC instead of 208VAC will also increase primary current. The goal is to try to run my transistors more or less within specifications for reliable operation. I managed to find a nice source for the hard-to-find 2.5" PVC pipe. There were clear PVC pipes available so I bought a small length of 2.5" Sch 40 PVC (2.875" OD) and a thin-wall 3" PVC (3.5" OD) pipe and cut them to length. 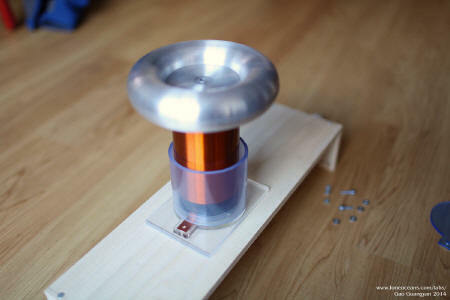 I also made a simple wooden jig with a 3/16" steel rod as my 'winding platform'. 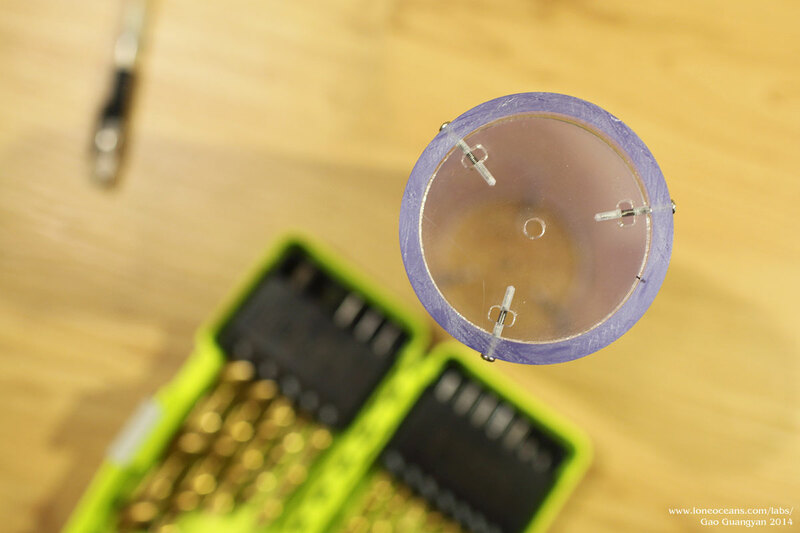 To support the secondary, I cut out two acrylic discs and threaded them through the thickness to accept three small screws each to secure them to the pipe as end-caps. Next up was winding the 34AWG enameled copper wire. I usually wind the coils by hand and every winding was a long, slow and tedious process. This time, I found that there was sufficient friction between the end-caps and the metal rod for me to attach a hand-drill to the rod and use the drill to spin the secondary pipe! This allowed me to wind the wire on very very quickly, and much more evenly than before. I found that there was an easy way to make sure the wire tracked in place perfectly - this was done by using my finger to 'guide' the wire into position, while the wire came in at a slight angle to the perpendicular of the secondary coil form. After some practice, I got the hang of it and wound the entire coil (700 turns or so) in less than ten minutes. 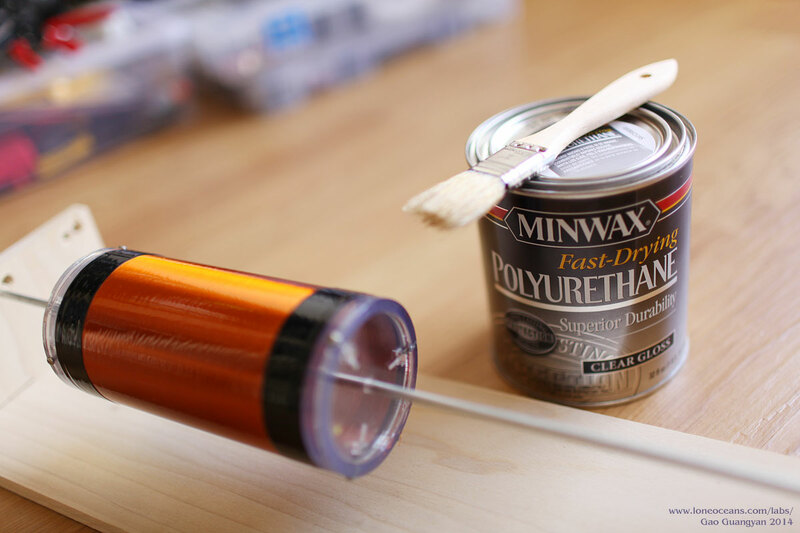 Once the coil was wound, I secured the ends with vinyl tape, and then gave the coil five thin coats of oil-based clear gloss finish Minwax polyurethane varnish. This gave it a beautiful finish, like glass! 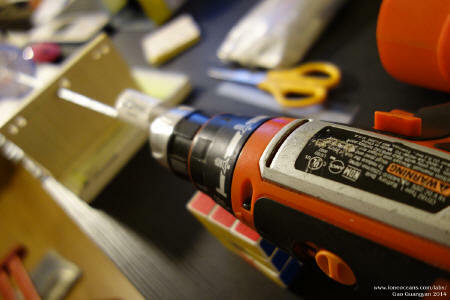 I again use the drill to spin the coil while applying the varnish, allowing for a smooth finish with no drips. Finally, I threaded two 1/4-20 threads at the end-caps to accept nylon bolts. The magnet wire was terminated to thin copper tape at each end of the coil and soldered in place. For the primary, I used the 3" pipe and glued it to another acrylic base. The base also has a copper strip with a wire lug termination for connecting to the ground-end of the secondary coil. The entire assembly is then easily screwed together with nylon screws, though this is not strictly necessary (I've used metal bolts before). I also wanted to make the coil as easy to disassemble as possible, so I simply glued four magnets to the base of the acrylic coil-stand. 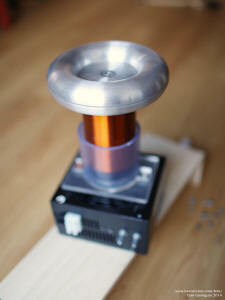 This allows the coilform to stick easily onto the metal box of the coil. 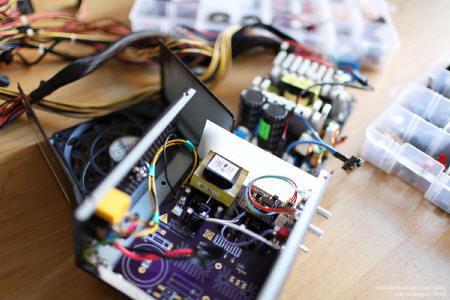 The only thing remains is to connect the two primary wires and the secondary ground! For simplicity and lower part count/cost, I decided to use a conventional half-bridge of FGH40N60SMD TO-247 IGBTs. These are rated 600V 80A, and I chose them for their low price (~$3 a piece) and surprisingly fast switching speeds. The data-sheet also lists their peak current at 120A at 25C. But how fast can we actually run them? Summing their total switching delays, we get 137ns typical (compared with the 219ns from the 60n65 IGBTs I used in some previous projects). The general rule of thumb is to keep the switching time no more than 10% of each cycle. Since the transistors need to switch twice a cycle, we end up with a maximum frequency of about 365kHz. 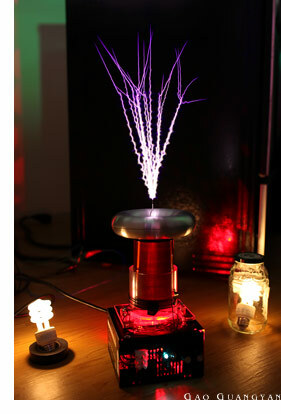 This is great because we want to keep the switching frequency as high as possible to produce straight sparks. Hopefully, the IGBTs will stand up to being switched at 400kHz at <40A or so, which is the maximum current I plan to run the primary at. In fact, comparing specifications to a well known high-voltage 20A 500V MOSFET (the IRFP460), you'll notice that not only does the the IGBT have faster switching characteristics, but is also comparable to drive. I have seen the IRFP460 running at about 30-35A at around 500-600kHz, so we'll see if these 40n60smd IGBTs hold up! For gate driver, I used a simple gate-drive-transformer with a 10:13 primary : secondary step up. with +-12V input in the primary, I get a +-15.6V gate drive signal to the IGBTs. For more information, see my SSTC 2 write-up on GDTs. The only thing to take note of is the phasing of the gate drive (so the IGBTs are in opposition) and the use of a suitable ferrite toroid. Long story short - I designed the coil for 240VAC operation but was limited to 120VAC in my apartment. For more power and bigger sparks, I used 2 phases off 3 phase for a 208VAC. This section might be helpful for those wanting more voltage than 120VAC. In order to create as big sparks as possible, we want to maximize the primary current as well as the primary voltage, but not so much that we destroy our transistors. We also want our input voltage ramp to be as large as possible. However, being in the US at the moment, I am limited to a 120VAC source, which gives me at best a 0 to 170V ramp along the first quarter of the sine wave in a period. Fortunately, I discovered that my apartment had a NEMA 14-50R receptacle used for my oven/stove. I was initially excited because this is the same socket use commonly in Recreational Vehicles (RV), which is wired up as described here. RVs in the US have a standardized 4-pin 14-50R receptacle, with G (green, ground), W (white, neutral), and a X and Y, usually black and red, and rated 50A. The configuration allows for three circuits. W to X or Y gives two 125VAC services. Ideally they should be balanced. Any imbalanced current flows through the neutral wire, or none if both loads are balanced. X and Y provide a 250VAC service for larger appliances like a stove top. Therefore, I thought that my had what is known as a High-leg delta configuration, which gives 240/250V between two phases and one 208VAC high leg. You can also read about Split-phase electric power, which also gives 240/120VAC, common in USA residential homes. However, this was not the case! As per the above 14-50R labeling, I measured 120V between X or Y and W, and 208V between X and Y. This suggests that my apartment uses a standard 3-phase Y-configuration 120V which each phase is 120 degrees apart, give 208V between two phases. This makes sense for apartments since lift motors and large motors for HVAC run well on these conventional 120/208 3 phase power. As the above image from here shows, my apartment is wired with the left configuration (with 208V instead of 400V and 120 instead of 230). Regardless, I'm still glad to have a 208V 50A power source for this and future projects, which gives me an ample 10.4kW of power at my disposal! 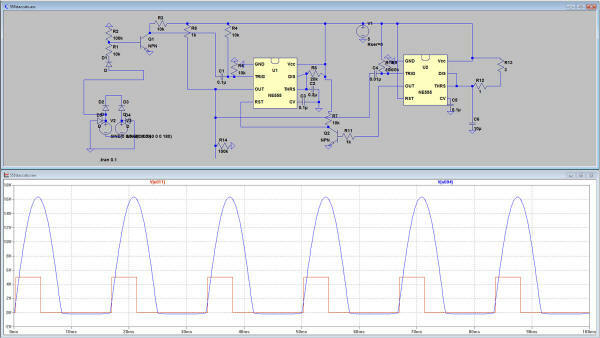 Specifically for this project, this means that I will be able to achieve a ramp from 0 to 294V, a big jump over 170V. Additionally, I plan to make this coil suitable for running on a 240VAC line. My driver electronics running from a 12VAC transformer should still perform well with 208V input, since this will still give me 14.7VDC after rectification. For a quick and easy connection, I bought a NEMA 14-50P plug from ebay and spliced a standard IEC cable to it for easy connectivity. Note that this coil will not use anywhere near 50A RMS, which justifies my use in the low-current-carrying IEC cable. From the FGA60N65SMD IGBT (many others of the same class have similar characteristics; I used this instead of the 40N60 I'm actually using since it's slightly more difficult to drive), we find Q_g = 189nC with 284nC max. With f = 400kHz, and assuming we use a +-18V gate drive with the same configuration as my SSTC 2 for a half bridge, the total drive power will be 2.72W per IGBT, 5.44W total. Given that the UCC27425 handles an average current of 0.2A while the UCC27322/21 pair handles 0.6A (7.2W at 12V), we can see that using the higher power capability of the 27322/1 pair will help out, especially since we'll be driving this coil at a high frequency. Using the pair leads to higher cost but I believe it'll be worth the extra cost for increased robustness. 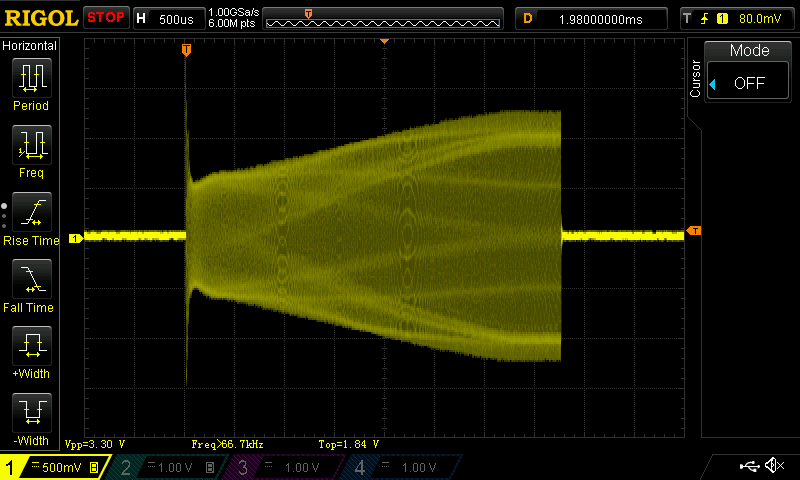 After I assembled the driver, I tested the basic functionality with an oscilloscope. One thing I had to think about when making this design was whether to use primary current or secondary current feedback. In a DRSSTC, primary current makes more sense because we want to get the IGBTs to switch as nicely as possible - ZVS (resonant switching), and primary feedback allows this. However, this is not possible in a SSTC because conventional SSTCs do not have tuned primaries. Fortunately, either variation can be done with the same feedback input, so I have decided to go with the easier secondary feedback for the driver. This not only allows a simple antenna to be attached to the driver, but also an off-board CT for secondary or primary feedback. 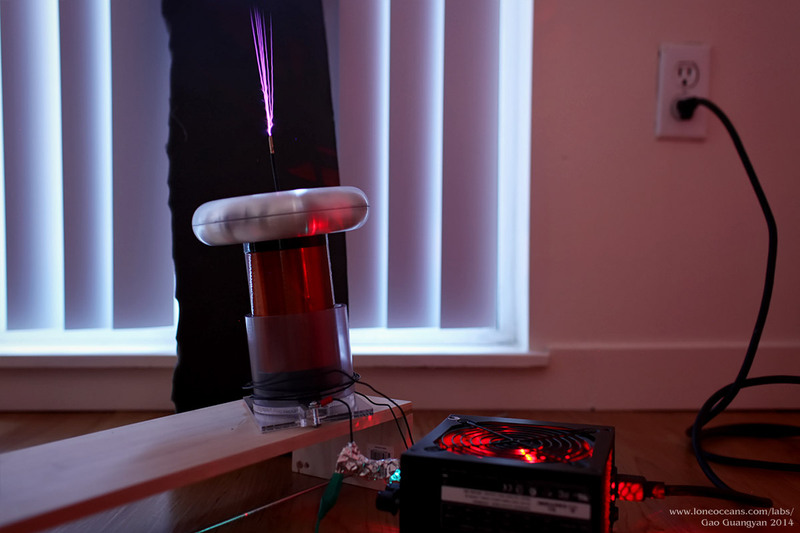 I made a secondary feedback transformer using a ferrite core with 50 turns of wire. 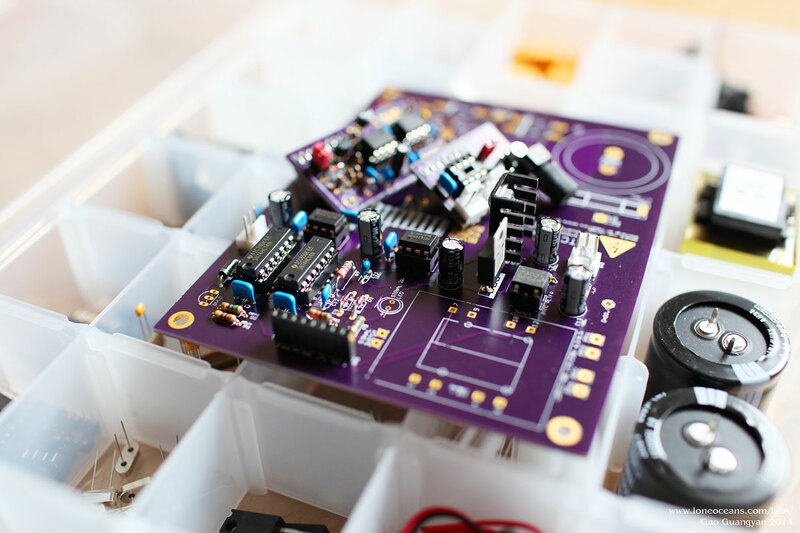 As part of my general purpose design philosophy for this project, I made the main driver and inverter board have a general purpose 8-pin jack for plugging in any sort of interrupter. The 8 pins provision for +12V, +5V, 12VAC, Signal In, and 4 grounds. 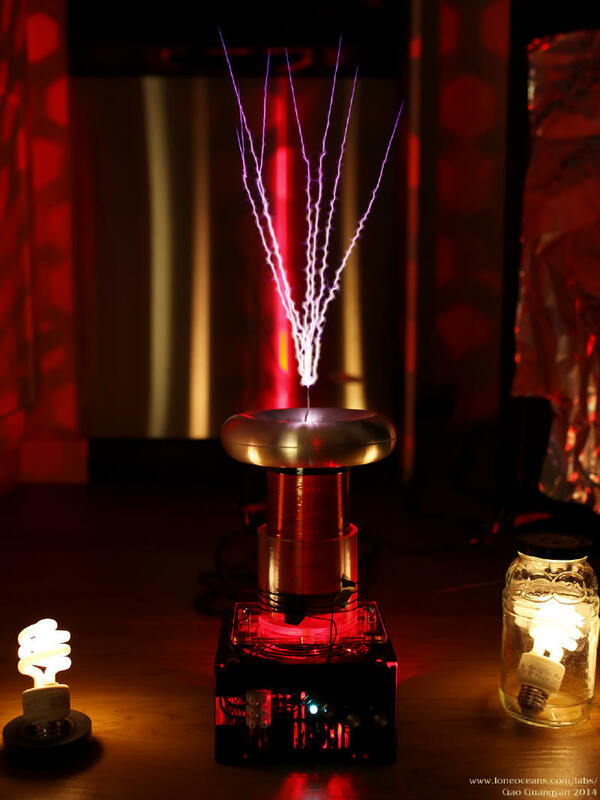 The core of this project was to produce sword-like sparks, which is achieved via a standard staccato interrupter, as discussed previously in the background section. The controller makes use of the 12VAC input from the transformer (which is more or less in phase with the 120/240V primary) and creates the appropriate pulses triggered at the zero voltage crossing of the 12VAC wave. With all the components soldered up and the coil wound, it was time to put the Tesla Coil together. Everything came together perfectly and I must say the clear primary really completes the clean look of the coil. 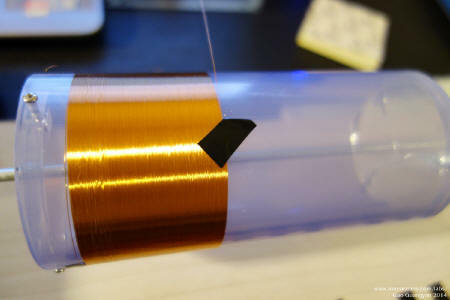 Note the copper tape which allows easy connection to the base of the secondary coil. I glued four magnets to the base of the acrylic support so it can easily attach to its power supply. The photos above show how the coil goes together. It fits perfectly and all that needed to be done were to solder the power cables to the switch and plug the potentiometers / switches to the board. Only three wire come out - the two primary cables and the secondary ground. Note the installed GDT and the current transformer. And here's how it compares in size with my previous SSTC 2! The coil is now ready for testing! After checking that the driver was working at 400kHz (I tested the driver by sending a signal from a function generator into the feedback and scoping the GDT outputs, and making sure it was responding to the interrupter), it was time to run the coil! First light was achieved at 120V input and everything worked perfectly on the first try! 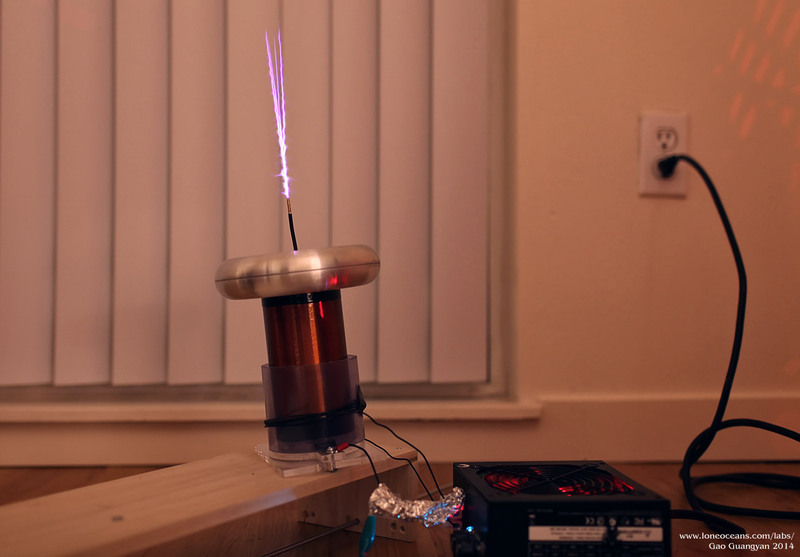 I used a 4-turn primary coil made of thin wire. With the primary coil bunched together, it easily produced about 5 to 6 inches of sword spark. This increased to something like 8 to 9" after widening the primary coil to about 2+cm wide. This is still sub 15A peak current. With testing having gone well, I went ahead to get some photos of it in action! 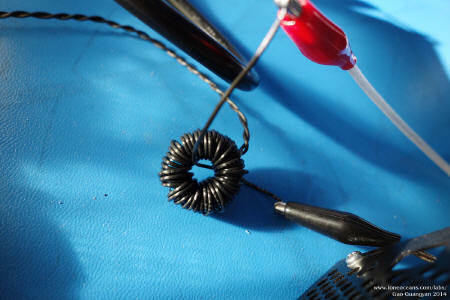 The coil performed exactly as expected, making curiously long, straight sparks with no branching. In addition, the smooth spark growth leads to a nice side-effect where the spark is surprisingly quiet compared to my other coils. It's beautiful and quite mesmerizing to watch. Running the coil out-of-sync with the rising ramp leads to the usual branched / forked sparks, so it is indeed the case that a nice ramped voltage input results in straight spark growth and quiet operation. 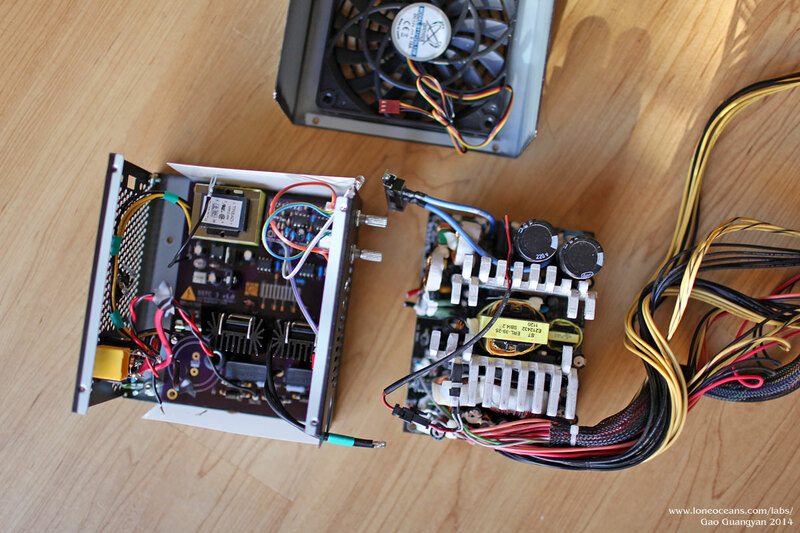 And finally here's a comparison of my SSTC 2 and 3 running together. Note the big differences in spark characteristics! It's nice to see how the smaller coil is making sparks about the same length as the larger one despite running at half the bus voltage (SSTC 2 has a voltage doubler on the bus). Now the next thing to do is to prep RSSTC 3 for a 208V run, and see if I can reach the goal of 30cm of sword spark from a small coil! The coil works great at 120V, but with a small input ramp (only +- 85V at the end of the ramp), the coil is really running at a much lower voltage than say SSTC 2 (which does +- 170V), it was time to test it at a higher voltage. As described above, I managed to get a cable to get 208VAC from my stove socket. I also had to make sure that this was sufficient for the logic transformer. It outputs 12VAC when wired for 230VAC in, this means I get 10.85V out, FWRed to get 15.3V. That's sufficient for my 12V regulator, and everything checks out well. I made sure the phasing for the staccato controller was correct, and plugged the coil right in. The pulse width control makes it easy to adjust the ramp magnitude. Then I plugged it in! It works great, almost like a small QCW coil! The longest spark I got was just about 12" from the photographs, which I think is brilliant for a 5" secondary with a normal SSTC with no doubler and a half bridge! It's doing really well with just 208V to the primary and I'm confident it'll hold up at 240V making even bigger sparks if I want to push it (and the extra ramp time I get with 50Hz instead of 60Hz in the US). So how does the primary current look like in practice? Well it looks exactly as we'd expect it to be! I measured it on my scope via a home-made current probe. Other than the spike at the start, we can see how the primary current grows from the start of the pulse till 3.75ms. The current slowly ramps up, ending at a bit less than 1.27V? 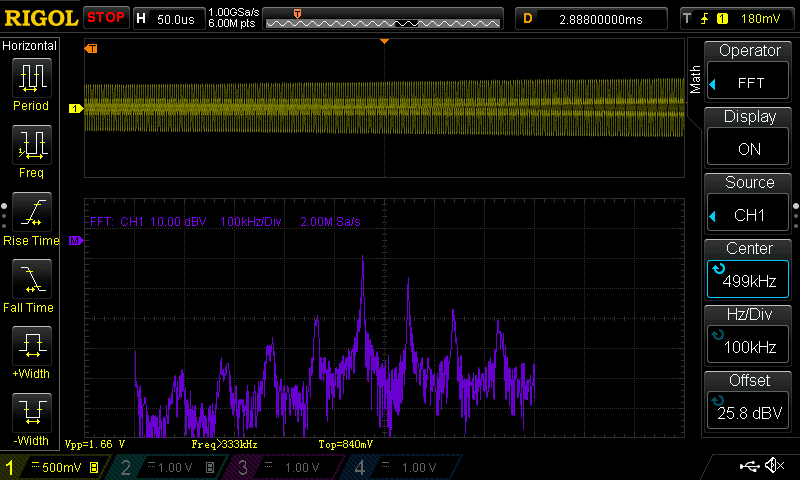 or so, corresponding to 31.75A on my 0.04V/A current probe. A FFT on the primary current also shows what looks like the FFT of the driving square wave fed into the resonant secondary. Here are some useful links on SSTCs and related information!